Energy efficiency first entered the public consciousness in the mid-1970s in the aftermath of the first “oil shock,” as the consequent high inflation eroded the purchasing power of the average family in oil-importing nations. Once some measure of price stability was restored, however, and the economies adjusted to higher oil prices, energy concerns receded into the background. After nearly 3 decades, energy supply security and costs recently returned to the limelight, with international oil and gas prices more than doubling over the past year. As high prices have begun to adversely affect corporate bottom lines—especially for energy-intensive industries such as oil and gas, chemicals, and pulp/paper—energy conservation is once again attracting management attention. Unfortunately, there is no quick fix for this situation. Successful energy conservation (or, more appropriately, energy optimization) is a long-term effort: a marathon, not a sprint. Success requires sustained commitment. On the positive side, there has been tremendous innovation in both the efficient conversion and use of energy. Many new products, design techniques, and operating practices have been developed in both academia and industry that offer the potential to significantly slash the energy intensity of virtually all manufacturing processes, reducing their carbon footprint (i.e., greenhouse gas emissions). An established body of literature documents the methods and benefits of what could be called “conventional” technical approaches that address the more obvious areas for improvement. Boiler/furnace efficiency improvement via excess air control, burner modifications, leakage reduction, etc. New types of equipment design—e.g., dryers, low-P filters, etc. The vast majority of industrial energy programs started over the past 25 years have focused on the foregoing tools and techniques. While these are undoubtedly positive steps, in most cases the cumulative savings potential is limited to a relatively meager 5 to 10 percent of the base-case energy intensity. To capture truly significant savings—on the order of 15 to 50 percent—advanced optimization techniques developed over the past 20 years encompassing both design and operational best practices must be employed. Monitoring and targeting, including development of equipment energy performance indices (EPIs) and overall process/product/plant energy key performance indicators (KPIs). Data collection and quality is a critical issue. Probably the most significant development of the past 30 years since the first oil shock has been Pinch Analysis. It burst onto the scene in the late 1970s and captured the imagination of the international chemical engineering community with its elegant synthesis of thermodynamic rigor and graphical techniques to solve the hitherto intractable “structural optimization” problem using simple heuristics. Imperial Chemical Industries (United Kingdom) and Union Carbide Corp. (United States) were the early pioneers. By the mid 1980s, a torrent of literature on new advances and industrial success stories was pouring out from both universities and industry. Many companies jumped on the new bandwagon, but most of them found success elusive. Gradually, but not surprisingly, Pinch Analysis developed an undeserved reputation for being just another passing fad oversold by unscrupulous consultants seeking a quick buck. Although it is undeniable that some consultants were indeed underqualified, it is instructive to examine the reasons why some companies achieved spectacular success while others failed miserably. From this author’s 20 years of experience in the energy business, both as a buyer and seller, the evidence is clear that most of the failures can be attributed to critical mistakes on the part of senior management. Believing that because Pinch Analysis was easy to understand at a theoretical level, it would be easy to apply at a practical level. Attending a 1-week course on the subject does not render the student an expert. It takes at least two to three projects’ worth of experience to use the software and apply the methodology correctly. Expecting that identification of energy optimization opportunities would automatically result in project implementation. Underestimating the vital importance of reliable data and a supporting infrastructure. Denying corporate energy teams adequate resources in terms of authority, staffing, budget, and time to do the job properly. Good technology, while necessary, is not sufficient to ensure success. It must be supported by a comprehensive, organization-wide program that removes institutional barriers related to legal, financial, and bureaucratic hurdles. This company is the largest crude oil producer/exporter in the world, with a maximum sustained production capacity over 10 million barrels per day of crude oil and 8,000 million standard cubic feet per day of natural gas. The company operates approximately 32 large gas–oil separation plants, 5 wholly owned oil refineries processing 1,600 thousand barrels per day of crude, 5 gas processing plants, and 2 condensate fractionation plants. From a standing start, the company reduced its energy intensity by 25 percent within 6 years. How did the company manage to achieve such spectacular success despite an untrained workforce, low energy costs (75 cents/MMBtu for gas, 30 cents/MMBtu for fuel oil, and 3.2 cents/kwh for purchased power), high capital costs (generally 1.3 to 1.5 times U.S. Gulf Coast costs), and a national culture based on the conviction that the oil supply is infinite? It all started in 1997, when one of the company’s engineers attended an energy conference in Houston and realized that the company’s policies and practices were based on incorrect assumptions and urgently needed to be revamped in light of a changing business environment. With support from the Vice President (VP) of Engineering Services, he got approval for an internal, company-wide survey of actual fuel and power consumption. (Historically, energy was considered to be so cheap that the company did not bother to include fuel and power as cost items in their accounting system). Even at the low values assigned to energy by the accounting department, the cost proved to be staggering, approaching $1 billion per year. When this information was brought to the attention of senior management, they committed the required internal manpower and about $1 million in expenses to conduct a more detailed study by a team of specialized energy/management consultants (including the author of this article). The 8-month study (conducted in 1998 to 1999) included verification of energy consumption, an estimate of economically feasible savings potential (based on quick audits of 12 representative facilities, lasting 1 week each), and an assessment of company policies and practices that should be instituted or modified to ensure success. The principal credit belongs to the company’s senior management, who understood, accepted, and supported virtually all of the resulting recommendations. A corporate energy policy was promulgated in 2000, and an Energy Management Steering Committee (EMSC) was formed in 2001, with plant-manager level representation, to oversee the program. The company decided to develop core in-house expertise to manage the program and supplement short-term peaks in manpower needs through the use of external consultants. A new Energy Systems Unit (ESU) was established at corporate engineering in 2001, with funding approval for 9 to 12 full-time engineers and an administrative assistant to help implement the EMSC’s strategic plan. The EMSC developed a 10-year goal (publicized company-wide) to reduce corporate energy intensity by 50 percent compared to the year 2000 baseline, and rolling 5-year plans to achieve the target. The results are a testament to the success of the program. It is interesting to note that even if no further projects are approved, the company will have achieved a 40-percent reduction in energy intensity. Once additional projects—identified but not yet approved for funding—are implemented, the original target of 50-percent reduction in energy intensity by 2010 should be met comfortably. Credit also must go to the EMSC’s well-conceived and executed strategy, which clearly recognized the importance of non-technical factors. Key elements of the strategy are outlined below. Optimize facility design and operation through deployment of industry-accepted best practices and economically sound leading edge technologies. Build a supportive organizational infrastructure. Promote transparency and accountability through development and deployment of energy KPIs and EPIs. Develop in-house technical expertise supplemented by outsourcing as needed. Energy optimization of existing facilities (retrofit basis) was an important first step in establishing credibility for the technical approach and demonstrating that the targets set by the EMSC were realistic and achievable. To begin, the ESU was staffed by one energy consultant recruited from the United States (the author) and four company engineers. All studies were conducted by ESU staff principally as a means to gain experience and build in-house technical expertise. As the workload grew, additional engineers were transferred to the ESU from other parts of the company, and a second energy specialist with Pinch Analysis expertise was recruited from the United States. This multi-year effort helped foster close working relationships and build trust between the plant engineers and corporate staff. When the workload began to exceed in-house capacity, some of the detailed energy studies were outsourced to qualified consulting firms from the United States, the United Kingdom, and India. One of the key requirements for successful outsourcing is that the buyer should be able to specify the proper scope of work, select the consultants correctly, and negotiate a fair price. It took 3 years for the company to develop skills as a sophisticated buyer. The initial trainees learned to understand the data requirements and knew what to expect in terms of quality of work, schedule, and cost. They were able to redirect the consultants’ work if they felt they were on the wrong track and would make contractual work scope changes on the fly. They knew when to allow more time or money and when not to. Unless the buyer is knowledgeable, or engages a trustworthy consultant, there is high risk that outsourcing can turn into a disastrous experience. A total of 15 retrofit studies were carried out over 7 years by the ESU. More than 100 company engineers, mostly from the plants, were put through 1- to 2-week training courses in energy optimization that included both technical and management issues. Of these, about 20 engineers who showed interest and promise were put through 1- to 2-year internship programs where they were selected to participate in conducting two or three of the retrofit energy optimization studies. They then became the foundation for new energy teams established at their respective plants. The results achieved from 2001 through 2006 are summarized in Table 1. One can see that more than 50 percent of the project ideas came from the plants themselves, with technical support from corporate engineering only as needed. 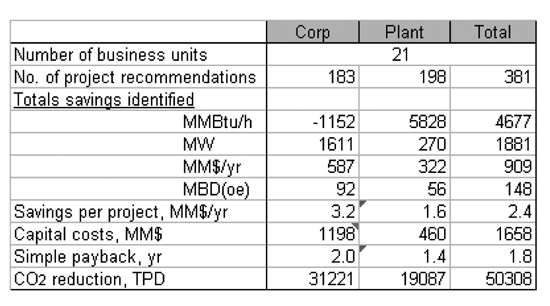 The corporate studies intentionally focused on advanced techniques to address the less obvious optimization opportunities, leaving the plant energy teams to focus on more easily implementable “conventional” projects. The actual overall implementation rate (in terms of dollars) was 54 percent. However, the energy KPIs showed unambiguously that there was a huge variation in performance among the 21 business units: some had implementation rates over 90 percent, while others were below 5 percent. Clearly, the problem lay not in the technical solutions, but in the human factor. This issue is being given top priority in the latest strategic plan. Empowerment of plant engineers through providing adequate resources to the energy teams in terms of qualified manpower, training, and budgets that would enable them to prepare credible and properly documented capital budget requests to corporate engineering. Energy Optimization of New Plants. Once the credibility of the technical approach was established through retrofit studies, the ESU turned its attention to new plants being built by the company—new process units at existing sites and greenfield sites—to try building energy efficiency into the design from the start. While the concept makes perfect sense, they ran into hurdles due to established company practices. The company never did (and still does not) develop its own process designs, but relies on engineering, procurement, and construction (EPC) contractors to provide them. Design/build responsibility lies entirely with the project management organization, where the path to promotion has historically been through only two performance criteria: beat the schedule, and complete under budget. No effort was made to optimize energy costs, which were assumed to be inconsequential. It is no wonder the entire organizational culture became strongly biased toward tried-and-true technologies (i.e., outdated), cutting out any features (e.g., energy efficiency) that could help reduce capital costs. There have even been instances where the contractors simply re-used previous designs from other projects in other countries, without even bothering to change the title blocks on the drawings! Naturally, all attempts by the ESU to introduce modern, energy-efficient practices met with determined resistance, being rightly seen as having the potential to extend the design schedule and increase capital costs. It took 3 years of personal lobbying with key influential people just to gain initial acceptance of the idea that the correct way to optimize a design was on the basis of life-cycle costs, not first cost. Real-life examples were provided: case studies where energy optimization led to shortened schedules as well as lower capital costs. Once this was accomplished, it opened the door to the concept of optimizing process/utility designs for site-specific conditions and including energy costs as one of the factors that should be included. Ultimately, the requirement for an integrated process-CHP energy optimization study during the front-end engineering design stage was accepted as an internationally accepted, value-improving practice and written into the company standards.